The Fairy Lough is the second of six settings of poems from Moira O’Neill’s Songs of the Glens of Antrim (1900) published by Stanford as An Irish Idyll in Six Miniatures in 1901. Though her poetry is little known today and generally criticized for its quaintness, O’Neill (the nom de plume of Agnes Nesta Skrine) was highly thought of in her day for her Hiberno-English verse by Irish critics such as Ernest Boyd and Stephen Gwynn. Plunket Greene, who sang The Fairy Lough at Bechstein Hall in March 1903 (with the composer accompanying), considered it one of Stanford’s most characteristic songs and gave it special attention in his book The Interpretation of Song (published in 1912). The orchestration of the song, which included a small revision of the ending, was made on 12 September 1909. 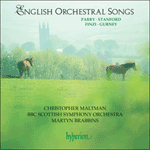 Whether the orchestral version ever received a performance is unclear, and this recording may indeed be its first hearing. One of the most distinctive elements of The Fairy Lough, a picture of a magical, yet elusive place high in the hills, is the initial progression from the tonic to a first inversion of the flat mediant (in lieu of the dominant). This harmonic shift establishes a precedent for further flat-wise movement which can be felt immediately in the first climactic flowering in bar 3 on the flattened seventh, but the trend continues in each verse (for example, ‘Float roun’ the one green island On the fairy lough asleep’) and even influences the dark hues of the enchanting plagal cadence at the end of each verse. Deftly scored for double woodwind (no oboes), horns, harp and muted strings, Stanford evidently wished to enhance the atmospheric character of the song, and its slightly lower tessitura in D flat (rather than the original D) gives the accompaniment a greater richness and sonority. Moreover, the single arpeggiated idea heard at the opening, motivically integral to the piece as a whole, is given increased focus by the recurrent timbre of the clarinet. 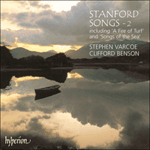 Other features, notably the delightful woodwind filigree, harp harmonics, and the contrast of full strings with solo string quartet, all exhibit Stanford’s truly pointillistic skills in the art of instrumentation. The wather’s black an’ deep. On the fairy lough asleep. ‘Tis a curlew whistles sweet! The flittherin’ moths are free. An’ no one there to see. The Antrim-born poetess, Moira O’Neill (pseudonym of Agnes Nesta Skrine), published her collection Songs of the Glens of Antrim in 1900. Written in somewhat fashionable Hiberno-English, the poems quickly gained a large following – to such an extent, in fact, that O’Neill produced an additional volume in 1921. It must have been shortly after the 1900 publication that Stanford came across the collection, for, with extraordinary alacrity, he composed An Irish Idyll in Six Miniatures, the first of his five Irish cycles and collections. Published by Boosey in 1901 the cycle was dedicated to Harry Plunket Greene, who was its most ardent advocate and executant. Indeed Plunket Greene considered the second song of the cycle, The Fairy Lough, to be Stanford’s finest essay in the art of imagery, a view evidenced by his conspicuous discussion of the song’s pictorial dimension in Interpretation in Song (1912) and Charles Villiers Stanford (1935). With this illustrative potential in mind, Stanford orchestrated the song in 1909 for small forces with appropriate legerdemain, presumably with Plunket Greene in mind, though it is unclear whether a performance in this version was ever given. A sylph-like berceuse, The Fairy Lough describes a remote, dark lake, high in the hills, full of ethereal or even ghostly sounds – floating seagulls, curlew calls, flittering moths, lapping water and crepuscular horsemen – all of which are depicted in the uncomplicated strophic design. But surely most memorable is the opening progression of first-inversion chords – tonic to flat mediant (in lieu of the dominant) – which pervades the entire structure, influencing the flat-wise movement of the harmony and the dark cadential formulae. The water’s black an’ deep. ’Tis a curlew whistles sweet! An’ flees, as if on feet. And no one there to see.